Commander Ron Caldwell of the William A. Baker American Legion Post #363, Lucasville, along with fellow Legionnaires, were on hand recently to accept a $100 donation from the Scioto Valley Volunteers (SVV) Chapter, United States Daughters of the War of 1812, Ohio Society. Commander Ron Caldwell of the William A. Baker American Legion Post #363, Lucasville, along with fellow Legionnaires, were on hand recently to accept a $100 donation from the Scioto Valley Volunteers (SVV) Chapter, United States Daughters of the War of 1812, Ohio Society. 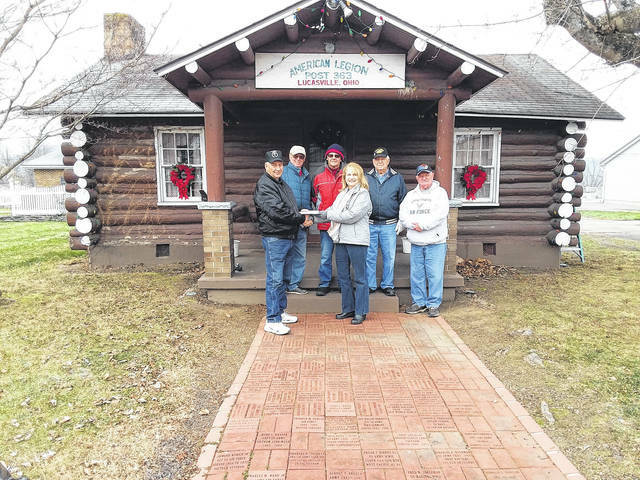 Chapter President, Beth Normand, caught up with the Legionnaires as they were decorating the Post “Cabin” for Christmas. According to Normand, the SVV Chapter’s members voted to include Post #363 in their annual local patriotic donations for 2017. On behalf of the members, Normand expressed appreciation for the support of the Post’s Honor Guard when they have been called upon to assist in the SVV’s veterans’ projects. Thanking each Legionnaire for their service to our country and our community, Normand expressed gratitude for the dignity and reverence the Honor Guard brings to the services held in memory of the veterans of the War of 1812. Any veteran who has served during the U.S. wartime is encouraged to join the William A. Baker Post #363; meetings are held on the first Tuesday of every month at 6:30. You may find them on Face Book. For N.S.U.S.D. 1812 Society membership information, you may contact the Scioto Valley Volunteers Chapter at svv1812@outlook.com, SVV, P.O. Box 22, Lucasville, OH 45648, or visit us on Face Book.